GROOVE WITH A FEELING-SOUNDS OF MEMPHIS-BOOGIE, SOUL AND FUNK 1975-1985. Ever since the birth of rock ’n’ roll, music has continued to evolve. As a result, musical genres have come and gone.Those that were resistant to change were left behind. That could’ve happened to many within the Memphis music industry in 1975. By then, soul music, which was one of Memphis’ most successful musical exports, was no longer as popular.Far from it. Soul music was very much yesterday’s sound. Disco had surpassed soul in popularity. This was a disaster for the city. Memphis was a musical city. Countless arrangers, backing vocalists, producers session musicians and songwriters relied upon soul music to make a living. Then there were engineers and studio owners.The change in musical tastes could prove disastrous for Memphis. Especially after the demise of Stax. Once one of the biggest soul labels of the sixties and even into the early seventies, Stax was one of the most successful of Memphis’ record labels. Throughout the sixties, it was a hit making machine. However, by 1975, Stax filed for bankruptcy. This once musical colossus was no more. Worse was to come. Hi Records, which was home to Al Green, Ann Peebles, O.V. Wright and Otis Clay was no longer the powerhouse it once was. Al Green its most successful artist had found religion. This just happened to coincide with a fall in his album sales. When Al Green Is Love was released in 1975, it reached number twenty-eight in the US Billboard 100 and number one in the US R&B charts. However, sales were way down, and Al Green Is Love became Al’s least successful album since 1971s Let’s Stay Together. This was as good as it got for Al Green. It was all downhill from here. That was the case with every soul label. However, Memphis was a soul city. Soul was an integral part of the local economy. Many people relied upon soul music for their living. Without soul music, many local economists feared for the city’s economy. What the local economists forgot, was the many within Memphis’ music industry had what economists called transferable skills. Not only could the musicians play soul, but the could play funk and boogie. At a pinch, they could even play disco. Many though, hoped it wouldn’t come to that. It didn’t; and for the next ten years, many within Memphis music industry made a living out of boogie, funk and even soul. This included many people connected with the Sounds Of Memphis label, which previously, had been one of the city’s soul labels. However, those at Sounds Of Memphis were realists. Record buyers no longer had an appetite for soul. So it was a case of making music people wanted. It’s documented on Groove With A Feeling-Sounds Of Memphis-Boogie, Soul and Funk 1975-1985, which has just been released by BGP, an imprint of Ace Records. Groove With A Feeling-Sounds Of Memphis-Boogie, Soul and Funk 1975-1985 is a nineteen track compilation. Among the contributors, are Lee Moore, Demetrius, Freedom Express, Fran Farley, Everyday People and Vision. Ex Ovation Louis Williams and ex Hi Records backing vocalist Erma Moore. Many of the tracks have never been released before, and make their debut on Groove With A Feeling-Sounds Of Memphis-Boogie, Soul and Funk 1975-1985, which I’ll pick the highlights of. 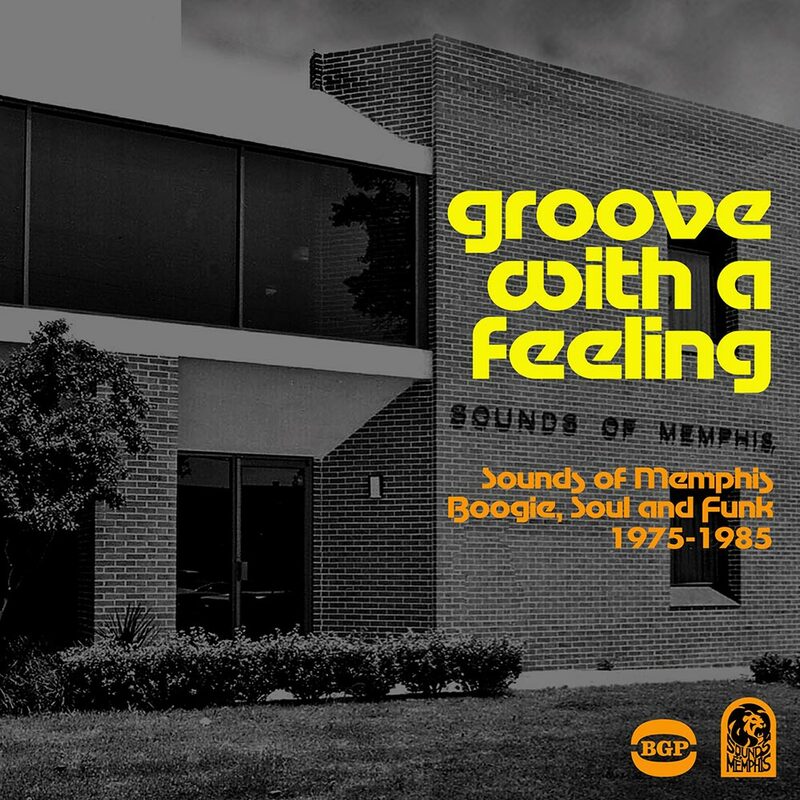 Opening Groove With A Feeling-Sounds Of Memphis-Boogie, Soul and Funk 1975-1985 is the first of three tracks from Lee Moore, You Can Bet I Can Get You Yet. This is the first of the unreleased tracks. It’s soulful slice of eighties boogie, that show’s Lee’s versatility. Previously, Lee had sung soul and disco. However, after disco’s demise, Lee knew he had to evolve as an artist. He combined his soulful past with the new boogie sound, on a session he cut for Sounds Of Memphis. A number of tracks were recorded, including Get Off, which Lee released as a single on his Score label. Sadly, You Can Bet I Can Get You Yet, What You Do For Love and What’s In The Dark were never released. However, these three slices of soulful boogie show just how talented and versatile a vocalist Lee Moore. For anyone familiar with the Hi Records’ discography, they’ll be familiar with the name Erma Shaw. She added backing vocals on many of Hi Records’ recordings in the late seventies. Like many backing singers, Erma wanted to embark upon a career as a solo artist. Her career began at Hi Records, where she released several singles. She then moved to Sounds Of Memphis, where she recorded Ridin’ a song she penned with Ben Cauley and Jerod Minnies. Another song Erma Shaw recorded was Attraction, which she cowrote with Jerod Minnies and Linda Lucchesi, who had taken over the running of the Sounds Of Memphis from her father. Ridin’ is best described as a fusion of funk and Southern Soul. It features a vocal powerhouse from Erma. Attraction shows how much soul music had changed by the early eighties. Synths and drum machines accompany Erma’s old school vocal, as she combines power and emotion. Sadly, neither track were ever released and make their debut Groove With A Feeling-Sounds Of Memphis-Boogie, Soul and Funk 1975-1985. By the time Linda Lucchesi took over the running of Sounds Of Memphis, Eddie Thomas was the bassist in the Sounds Of Memphis house band. Eddie wasn’t the only musician in the Thomas household. His son Demetrius had dreams of making a career as a singer. So, Eddie introduced Demetrius to Linda Lucchesi. She agreed to allow Demetrius to record several songs. This included One To One, which Richard Blackman, Wendell Moore and Eddie Thomas cowrote. In Demetrius’ hands, One To One became a futuristic sounding slice of funky boogie. Sadly, it was never released. Despite this, Linda asked Demetrius to cut Tighter Tighter with Takelia. Linda Lucchesi’s decision to pair Demetrius with Takelia proved a masterstroke. They seemed to bring out the best in each other. On Tighter Tighter, their vocals are soulful and heartfelt. They prove to be a potent and soulful partnership. Takelia proves to be yin to Demetrius’ yang. Despite the quality and soulfulness of Tighter Tighter, the song was never released as a single. However, somewhat belatedly, this hidden gem can be heard by a new generation of record buyers. The Ovations released their final single, Sweet Thing, in 1978. Not long after that, lead vocalist Louis Williams cut Don’t Fight It, the first single of his solo career. Don’t Fight It is a real fusion of influences. Everything from disco, funk, proto-boogie and soul is combined by Louis and the Sounds Of Memphis’ house band. The result is a track that straddles the disco and boogie era. Thirty-seven years later, Don’t Fight It has stood the test of time and will appeal to DJs and dancers alike. Fran Farley features three times on Groove With A Feeling-Sounds Of Memphis-Boogie, Soul and Funk 1975-1985. These three tracks show different sides to Fran Farley. Cold Blooded Sally, which Fran and Phillip Farley penned is an uber funky soulful cut. It sounds as if it belongs on a seventies Blaxploitation movie. Partly, that’s down to the performance of the Sounds Of Memphis’ house band. They up the funk factor. Got To Have My Own is very different to Cold Blooded Sally. Here, Fran delivers a soul-baring vocal against a much mure understated, subtle arrangement. Then on Lord Give Me A Little Of Your Heaven gospel and Southern Soul become one, creating a truly beautiful track. One of the funkiest tracks on Groove With A Feeling-Sounds Of Memphis-Boogie, Soul and Funk 1975-1985 comes courtesy of Everyday People. They wrote Politics, which is another genre defying track. It could be described as funk with a social conscience. There’s definitely a nod to Sly and The Family Stone and even, Gil Scott-Heron as Everyday People vamp their way through Politics, combining cutting social comment, funk, soul and even early hip hop. One of the most left-field tracks in Kannon’s New Lang Syne. It’s what would’ve happened if Jimmy Shand had dropped acid in the White Heather Club. Funk, fusion and boogie combine head on, resulting in an alternative and lysergic way to bring in the New Year. While The Jacksonians only ever released one single, they recorded a number of tracks at Sounds Of Memphis. This includes I’ll Be Around, which Thom Bell and Phil Hurtt cowrote. This is a cover of a song made famous by The Spinners. Apart from the occasional brief, funky intervention,mostly, The Jacksonians stay true to the original. There’s no attempt to reinvent the wheel. The result is what’s easily, one of the most soulful songs on Groove With A Feeling-Sounds Of Memphis-Boogie, Soul and Funk 1975-1985. Anyone who like their music funky and soulful will enjoy Donald O’Connor’s We Need Love. This is a track that Donald penned. That was before he became Earth, Wind and Fire’s keyboardist and musical director. Back when he recorded We Need Love, Donald was a solo artist. Sadly, fame and fortune eluded him. That’s despite being a talented singer, songwriter and keyboardist. Donald showcases his considerable skills on the truly joyous and irresistible We Need Love. Freedom Express feature twice on Groove With A Feeling-Sounds Of Memphis-Boogie, Soul and Funk 1975-1985. Very little is known about Freedom Express. Complicating matters, is that during there were two bands in Memphis with the same name. This Freedom Express are obviously a tight and talented band. Their first contribution is Groove With A Feeling, which lent its title to this BGP compilation. It’s a fusion of funk and soul. Adain the arrangement has a harder, uber funky sound. By comparison, the vocal is almost tender and restrained. However, the vocal comes into its own on Dream Girl. As a slow, meandering arrangement almost jazz-tinged unfolds, the vocal veers between sits a hopeful and needy, but always soulful. Dream Girl, which is a fusion soul and jazz, is a real find and is the perfect way to close Groove With A Feeling-Sounds Of Memphis-Boogie, Soul and Funk 1975-1985, in that it leaves you wanting more. After soul fell out of favour around 1975, many soul labels folded. These labels were resistant to change. They kept churning out music nobody wanted to hear. Just like the gambler who always thinks their luck will change with the next throw of the dice, these labels thought the next single would give them a much needed hit. It never did. Instead, they were pouring good money after bad. Eventually, they ran out of money and were forced to close their doors. Other soul labels, including Sounds Of Memphis, realised they had to evolve. So between 1975 and 1985, Sounds Of Memphis released a much more eclectic selection of music. Boogie, funk and soul was recorded and released by Sounds Of Memphis. This was the only way. Sounds Of Memphis had to change. That’s apparent from the nineteen tracks on Groove With A Feeling-Sounds Of Memphis-Boogie, Soul and Funk 1975-1985, which was recently released by BGP, an imprint of Ace Records. Not only did Sounds Of Memphis evolve musically, but incorporated the new technology that was making its way into studios across America. By the late-seventies and early-eighties, drum machines, synths and sequencers were playing a much more important part in music. Some musicians and labels resisted these changes. Not Sounds Of Memphis. They realised this new technology wasn’t going away, so embraced it. It can be heard throughout Groove With A Feeling-Sounds Of Memphis-Boogie, Soul and Funk 1975-1985, which shows another side to the music Sounds Of Memphis released. No longer were they a soul label. By that time Linda Lucchesi had taken over the running of Sounds Of Memphis. She knew that music was changing, and changing fast. Linda also knew that labels that didn’t embrace change, risked their future. There was no way she was going to let that happen to Sounds Of Memphis. Other label owners realised this too. The demise of Stax had been a shock to many label owner’s system. It forced their hand, they had to change. Having moved from being just a soul label, to a label that released what record buyers wanted to hear Sounds Of Memphis stood a better chance of surviving. Other record labels and recording studios in Memphis weren’t so lucky. The problem was, they were resistant to change. That was fatal, and ultimately costly. As Billy Paul and Jerry Butler sang, Only The Strong Survive. One of the survivors was Sounds Of Memphis. Linda Lucchesi made sure of that. She realised that Sounds Of Memphis had to record and release what people wanted to hear. Between 1975 and 1985, this including the boogie, funk and soul that features on Groove With A Feeling-Sounds Of Memphis-Boogie, Soul and Funk 1975-1985. ← HAPPY LOVIN’ TIME-SUNSHINE POP FROM THE GARPAX VAULTS.